(A) Transthoracic echocardiogram apical 4-chamber view showed thickened and retracted tricuspid valve leaflets in a semi-open position (arrowheads). (B) Right ventricular focused view shows mildly enlarged right ventricle. (C) Color flow imaging revealed severe tricuspid regurgitation toward the septal tricuspid valve leaflet. 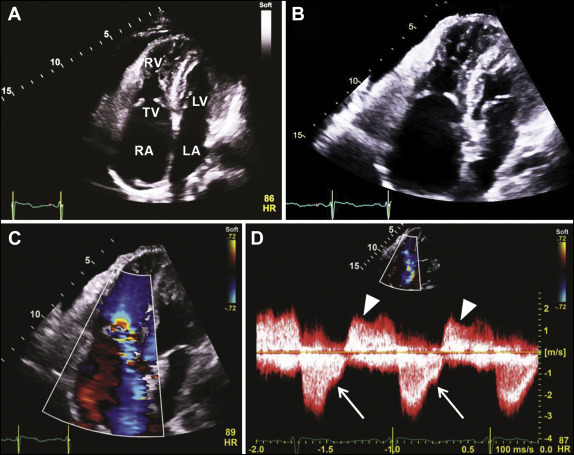 (D) Continuous-wave Doppler interrogation of tricuspid regurgitation revealed a peak velocity of 3 m/s with a rapid taper (white arrows) indicative of high right atrial pressures. Tricuspid in-flow velocities are increased (white arrowheads) with a gradient of 7 mm Hg due to fixed semi-open tricuspid valve leaflets and increased diastolic flow because of severe tricuspid regurgitation. LA = left atrium; LV = left ventricle; RA = right atrium; RV = right ventricle. A 58-year-old African American woman with a history of well-controlled hypertension (on amlodipine and lisinopril) presented with a 2-month history of anorexia, early satiety, dysgeusia, and intermittent loose stools, symptoms that had progressed to the point that she had experienced a 20-pound weight loss. These abdominal symptoms also were accompanied by progressive exertional dyspnea and lower-extremity edema. Additionally, she had noticed increasing episodes of wheezing over the past month or so. The physical examination was notable for an elevated jugular venous pressure of 12 mm Hg with prominent V waves, right ventricular heave, and a grade 2/6-intensity systolic ejection murmur at the left upper sternal border, as well as a grade 3/6-intensity holosystolic murmur in the left lower sternal border. The abdominal examination was notable for mild hepatomegaly with the lower liver border located 3 cm below the right costal margin. No splenomegaly was noted. The extremity examination was notable for 1-plus pitting edema bilaterally. Given her symptoms of nausea and wheezing, and signs and symptoms of right heart failure, a presumptive diagnosis of carcinoid heart disease was entertained. Transthoracic echocardiography confirmed the clinical suspicion of carcinoid heart disease. Echocardiography revealed thickened, retracted tricuspid valve leaflets fixed in a semi-open position, severe tricuspid regurgitation, and moderate tricuspid stenosis (Figure 1). The pulmonic valve also was thickened and had reduced opening. Moderate pulmonic valve regurgitation was noted. The right ventricle was increased in size, with mildly decreased systolic function. Further diagnostic studies included a liver ultrasound that revealed numerous, rounded hyperechoic lesions throughout both lobes of the liver (Figure 2A). Magnetic resonance imaging of the abdomen showed multiple solid-appearing lesions of spoke-wheel enhancement throughout both lobes of the liver, with the largest one measuring 9.4 × 11.3 × 5.7 cm (Figure 2B). Fluorodeoxyglucose (FDG)-positron emission tomography showed focal FDG accumulation near the ileocecal valve. A 3-cm soft-tissue mass was seen associated with wall thickening at the cecum (Figure 3A). Colonoscopic-assisted biopsy of this mass confirmed the diagnosis of neuroendocrine tumor. A biopsy of the liver lesion confirmed metastatic carcinoid disease (Figure 3B). The laboratory work-up revealed an elevated 24-hour urinary 5-hydroxyindoleacetic acid level of 172 mg (reference range: 0-15 mg/24 h) and an elevated chromogranin A level of 94 ng/mL (reference range ≤15 ng/mL).